Kemen TBoss Big Brother eviction and disqualification over fondling. 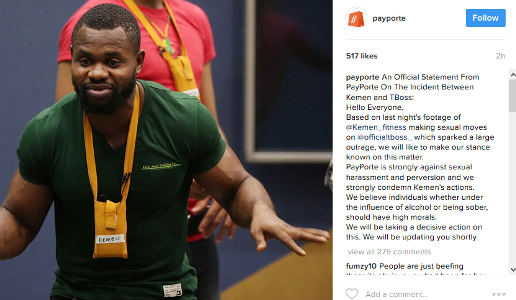 Controversy rocked Nigeria Big brother last night as the Kemen and tboss romance led to him being evicted and suffered disqualification for fondling her without consent.I don't know how this will work out in Africa,but had this been in Europe or America,it could have serious repercussions on his future. show,but there are some lines you just don't cross. Meanwhile, the latest eviction wasn’t based on names put up for eviction by housemates. Big Brother cancelled the weekly nomination exercise and housemates needed viewers’ votes to stay in the house.Bally, Bisola and Thin Tall Tony (TTT) were not up for eviction due to their respective advantage. TTT’s advantage was his immunity as the Head of House, after emerging winner of a balloon popping game. If you remember,last week, two fake housemates, Jon and Ese were booted out. The duo had been introduced into the house to keep house mates on their toes as they compete for the star prize of N25 million. But for now,the most talked about story in the household is the Kemen Big brother shocking story.It's been a very funny show from the start.The first controversy was the fact that it was held in South Africa,i thought and still think that is ridiculous.No wonder they look down at us. And then there was the over the top sexual nature of the show with the producers doing nothing to curb it. But at last,looks like something is being done to stop the rot.Is it too late though i hear you ask? Hello Everyone, Based on last night's footage of @Kemen_fitness making sexual moves on @officialtboss_ which sparked a large outrage, we will like to make our stance known on this matter. PayPorte is strongly against sexual harassment and perversion and we strongly condemn his actions. We believe individuals whether under the influence of alcohol or being sober, should have high morals. We will be taking a decisive action on this. We will be updating you shortly. If you ask me,i think it's disgraceful really.And now this,what is next?